Are you a lark or an owl? A person who is characterized as a lark or an early bird is one who usually gets up early in the morning and goes to bed early in the evening. A lark usually functions better on day shift. The person with characteristics of an owl, sometimes termed a night owl, stays up late and sleeps late in the morning. An owl would likely prefer night shifts. The issue for those who work rotating shifts is that they have to function well on both day and night shifts. While this is not impossible, it does present problems for some people. I have known people who thought they could tolerate the demands of shiftwork, but found out they could not handle the effects of rotating shifts. Most eventually quit the jobs. I remember a long ago coworker who did not just work rotating shifts, but was also on call at any hour of the day or night. When he was called out during the morning, he was fine. When he was called out at night, he whined and complained about the unfairness of the job. I suggested that he quit because he was making himself and the rest of us miserable with what I then termed his bad attitude. He did quit soon after. I am more informed now, and recognize it might have been because of his chronotype, even if he did have a bad attitude. He and his wife started a day care center for children, which only required daytime work from early in the morning to the afternoon. Maybe he was a lark, but it was not a lark working with him. Whether one is a lark or an owl is not just a personal preference, it is dependent on our chronotype. An individual’s chronotype is a biological trait, dependent on genetics and age. A chronotype is tied to our circadian rhythms and our internal body clock. There are a number of assessments online that can be used to determine a chronotype. Two are the Munich Chronotype Questionnaire and the Horne-Ostberg Morning-Eveningness Questionnaire. Do not quit your job based on the results! While a chronotype cannot be changed, each of us can make adjustments. As an owl type, I have to go to bed earlier than I prefer since our clients want to meet in the morning. I abstain from caffeine in the afternoon and stop looking at screens on TVs or devices about 9pm. That enables me to go to sleep earlier than my natural preference and I get an adequate amount of sleep most nights. Human beings tend to think in terms of polarities or opposing aspects. Some examples are: Either/Or, Home Life/Work Life, Cost/Quality, Team/Individual, and Collaboration/Competition. 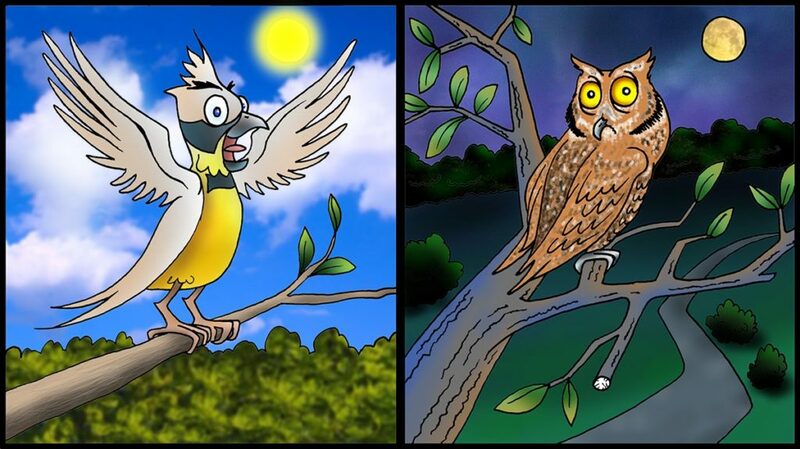 A polarity related to fatigue mitigation is whether or not a person is a Lark or an Owl. Studies show that most people are somewhere in between, and might be more of a Third Bird. I read a book by Daniel Pink earlier this year titled When: The Scientific Secrets of Perfect Timing and it contains some findings and recommendations about chronotypes. It’s a good read with helpful information that is applicable to fatigue mitigation in the first section. He offers a simple method to determine chronotype for those who do work a daytime schedule. What time do you wake up on days off? If it is the same as workdays, you are probably a Lark. If it is a little later, you are probably a Third Bird. If it is much later, you are probably an Owl. The book contains a chart, based on the research of chronobiologists Martha Merrow and Till Roenneberg, that 14% are Larks, 21% are Owls, and 65% are Third Birds. Perhaps the polarities of extreme Larks and extreme Owls are people who have the most difficulties with shiftwork. The rest can handle the effects with the personal fatigue countermeasures that work for them.